The new Silhouette Core Heavy Gear Miniature Rules takes the acclaimed Silhouette game mechanics to the next level, with game play from one on one Melee Scale to massive Fleet Scale battles. The new Melee Scale cobat is directly compatible with the SilCORE roleplaying rule set (DP9-909), including rules to convert your RPG character into miniature stats. Fight RPG characters against one another or against Heavy Gear critters or vehicles, in the Melee Scale. For the Gear Aces out there, there is the Duelist Scale with one on one gears battles using punches, kicks, swords, other melee weapons, guns, missiles and special duelist combo moves. 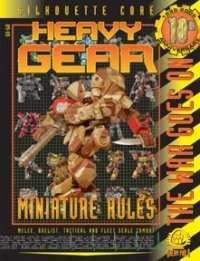 The Tactical Scale is still the main battle scale for the Heavy Gear universe, its been revamped to speed up the game and save time on record keeping. New rules additions include command points allowing you reroll any dice roll and streamlined ammo record keeping, plus new artillery, air and orbital strikes rules. The Fleet Scale is a new and separate rule set included in the book for massive battles with landships and small miniature squad counters representing gear, strider, armor, infantry and air squads. New smaller Fleet Scale miniatures are now available for this scale. Full color layout with images saved at 150 dpi, 80 pages plus front and back covers. The best in Giant Robot miniature games just got better!